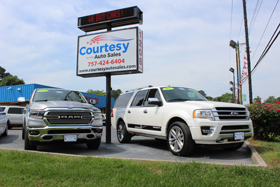 Welcome To Courtesy Auto Sales, A Family Owned And Operated Used Car Dealer In Both Chesapeake And Virginia Beach! Celebrating Over 42 Years In Business! Thank You For Choosing Us! We Appreciate Your Business! In 1976, I Opened Courtesy Auto Sales With My Father, Don Boucher Sr. In The Original Location At 900 Poindexter Street In Chesapeake. We Decided "Courtesy" Was The Perfect Name Because We Were Dedicated to Making Our Customer's Car-Buying Experience As Pleasurable As It Could Possibly Be. The Same Is True To This Day... Our Name Has Not Changed, Just Our Location. Eventually, We Expanded And Opened A Location On Military Highway. We Continued To Grow. Soon A Larger Location Was Available Close By, We Moved There And Consolidated Both Lots At 1208 S Military Highway In Chesapeake, Our Current Location. Our New Service Center Located at 1113 S. Military Hwy, Is Now Open To Better Serve Our Valued Customers. In September Of 2015 We Were Proud To Have Expanded To A Second Location In Virginia Beach At 800 S. Military Hwy Virginia Beach. Our Success Over The Years Is Due to Our Customer’s Loyalty And The Hard Work And Dedication Of Our Employees Who Strive To Achieve Complete Customer Satisfaction. Most Of Our Employees Have Been With The Company For Years And Are Serving Third-Generation Customers. Repeat Customers And Referrals Are The Foundation Of Our Business. I Am Proud to Announce The Arrival Of The Third Generation Of Courtesy Auto Sales, Justin Boucher. Justin Has Been Working Part Time Learning The Family Business For Many Years. A 2007 Graduate of Randolph Macon College With A Degree From The School Of Business, Justin is Eager To Apply His New Knowledge And Skill To Help The Current And Future Customer Of Courtesy Auto Sales. Please Call or Come By to Meet The Future of Courtesy Auto Sales. Justin And I Have Been Waiting For The Day He Would Work Next to Me Like I Had With My Father For So Many Happy Years. Our Goal is to Make Courtesy Auto Sales The Best Buying And Service Experience You Have Ever Had. At Courtesy, We Have Put Together A Complete Package Offering Great Used Cars, Prices, Financing And People. 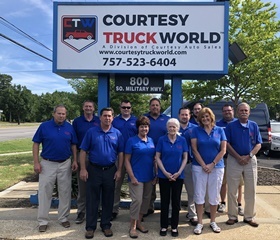 Located Conveniently Just Off The Interstate in Chesapeake And Virginia Beach, We Are Less Than 20 minutes From Most Locations in Hampton Roads. Courtesy Auto Sales Will Provide You With The Best Financing Available! -- We Have Numerous Lending Institutions Working Hard For You, With Rates As LOW As 2.9%!..From Banks To Credit Unions To IN-House Financing We Have A PAYMENT Plan For YOU! Courtesy Auto Sales HAS A HUGE Selection of Clean Car-Fax Certified Used Cars For ALL PRICE RANGES!...Chevrolet, Ford, Dodge, Honda, Toyota, Jeep, Nissan, Hyundai, Kia, Acura And MORE!...GREAT Selection OF Used Cars UNDER $10k! Courtesy Auto Sales Offers FINANCING For Those With Not So Good Credit...BAD Credit, Or 1st Time Buyer's With No Credit! 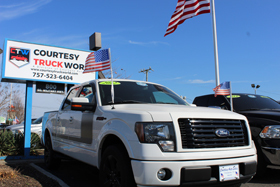 Courtesy Auto Sales Is Proudly Serving Your Used Car Needs In Chesapeake, Virginia Beach, Norfolk, Portsmouth, Suffolk, Hampton Roads, Richmond, And ALL Of The Virginia Areas SINCE 1976! !